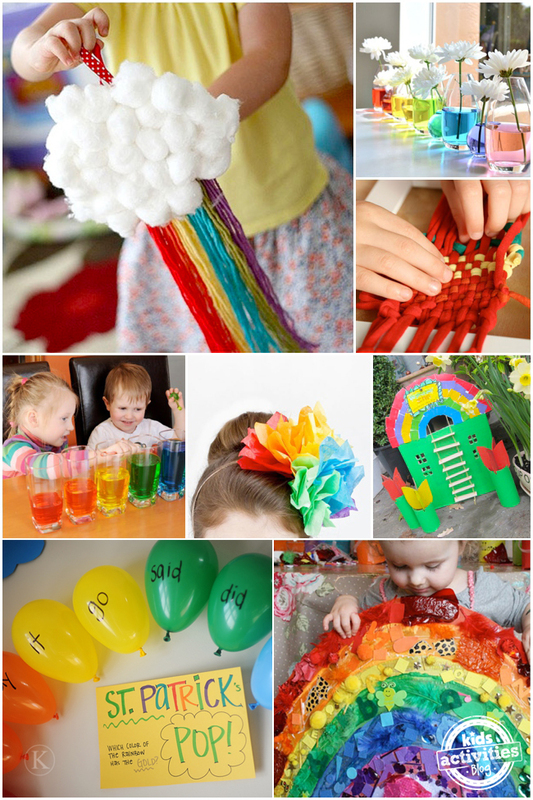 Celebrate the rainbow with 21 of our favorite fun and colorful rainbow crafts, sensory activity projects, and recipes for you and your little ones. Spring, St Patrick’s Day, or any day the rainbow is always welcome in our house! There is something so magical about rainbow crafts! Kids of all ages love them, and it brings them together. Whether you are crafting to get ready to celebrate St. Patrick’s Day, or just looking to brighten your house or classroom for spring, these ideas are sure to inspire! 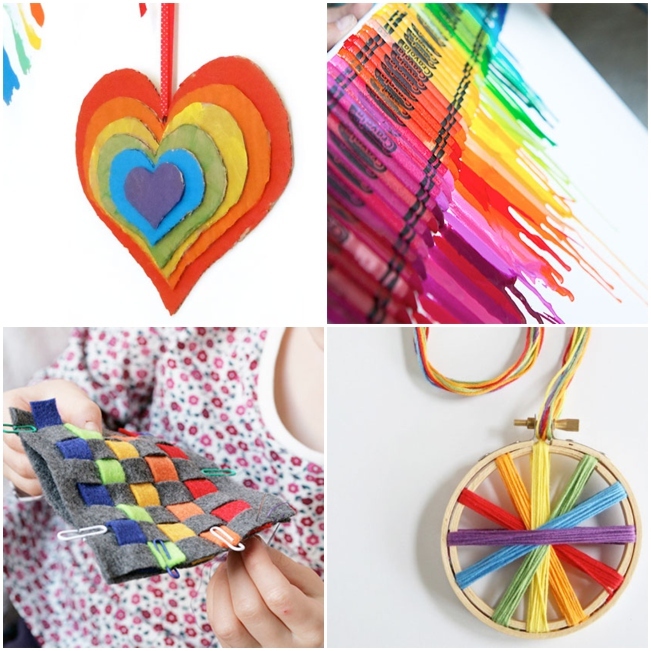 Framed Rainbow Weaving, from The Crafty Kitty, is a lovely ‘introduction to weaving with kids’ project, using recycled textile yarn to create a framed rainbow keepsake. Rainbow hues certainly aren’t limited to just St Patrick’s Day, thank goodness! How gorgeous is this DIY Rainbow Fascinator from studiodiy? Make a Rainbow Hotel For Little People! Decorate your cardboard playhouse or leprechaun trap with a colorful and welcoming rainbow roof. See the magic on MollyMooCrafts. Foster your children’s creative side by letting them make their own rainbows with this make a rainbow puzzle craft! Kids love to make slime, especially if it’s rainbow slime! 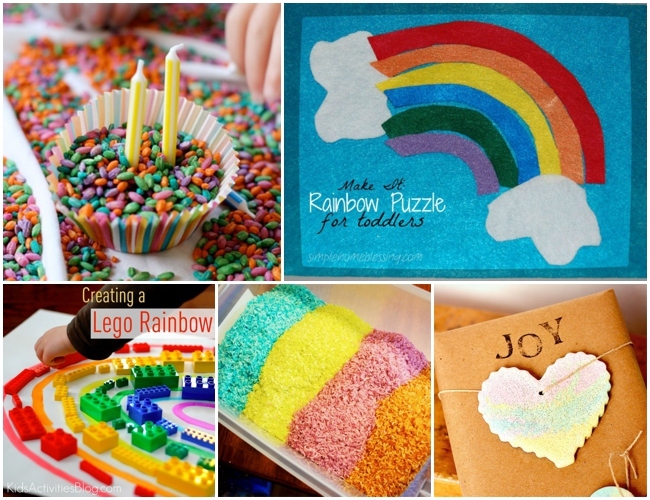 Your little LEGO fanatics will love creating a LEGO rainbow! 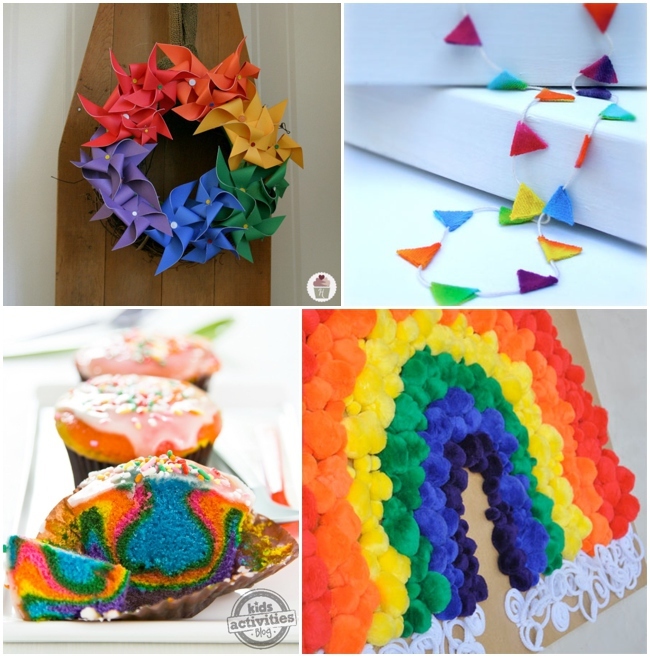 The Nerd’s Wife‘s construction paper rainbow craft is perfect for your preschooler! Let them explore with scented sensory rainbow beans! Color this cute rainbow printable with your little one! These rainbow treats are perfect for a St. Patrick’s Day party or any party really! Nothing brings out the smiles like a rainbow… especially if it’s in the form of a cake or treat! Rainbow Cupcakes are so fun to make! And when you’re finished baking, you’ll have a yummy and colorful treat! This rainbow Barbie cake with matching rainbow pushup cake pops, from Totally The Bomb, will be the hit of any party! Serve up some smiles with rainbow pasta. One of my favorite parts of any holiday or season change are the DIY decorations I get to make with my children to brighten the house and make it festive! These ideas would also work well for the classroom, too! Brighten the walls with rainbow cereal art! Use all the colors of the rainbow to create a rainbow centerpiece on your windowsill with this gorgeous craft from Papery & Cakery. It’s time to have some more fun with Rainbows and Pinwheels. This rainbow pinwheel wreath from Simple Easy Creative is so striking! Hello Glow’s rainbow woven felt coasters are a quick no-sew project that kids can easily whip up as a present. Who doesn’t love rainbows and putting the colors in order! Rainbow stacked hearts, from alittlelearningfortwo look great hanging on the wall or door! Making this melted crayon rainbow from megduerksen is so easy! Just glue the crayons onto canvas art board, and turn on the hair dryer. Makeandtakes‘ rainbow threaded embroidery hoop is a fun rainbow wheel of awesome! Comment below with your favorite rainbow crafts!